Be Known for Something : Discover Your Church Communication Thread / Business Essentials / Simplify! 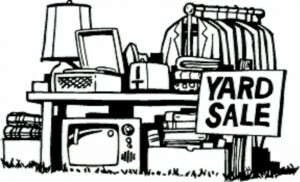 For the past month or so, my family has been planning a yard sale. I don’t know what that means to you, but after having several of them, it means a lot of work, for a minimum payout. Sounds fun, eh? Well, yesterday we held (hopefully our last) yard sale. Look at everything obvious in our home to decide if we needed it. Looked in the hidden areas, boxes, storage and closets. Advertised well. Played on benefits of coming to our sale. Got up early! Before the early-birds descended. 5:30 am. Ugh. Negotiated and had the philosophy to get rid of stuff, not to get rich. It worked. We cleaned up clutter, met neighbors, had lots of people. As a bonus, we even made more than we’ve ever made on a yard sale. Now, we have a nice budget to renovate the basement! Success. I love it. As a business, it’s easy for your marketing message to get cluttered. You need to simplify! It’s always easier to start simple and keep it simple, than to take something complex and make it simple. Decide what your one or two benefits are. Easier said than done. Trim the fat on your website, advertising and interactions with customers. Simplify the message so that the simple benefit shines through. Clients have a way with adding the complications. They love to request more. Think about the simple idea of twitter and how fast the audience developed. Companies and products sprung up around the simple idea. But only after the audience was quite large. That’s when you can add product lines. AFTER the success of your simple product idea. Don’t fall for the lie that you have to have a complex puzzle of interlocking products to attract a crowd. Simplicity sells.